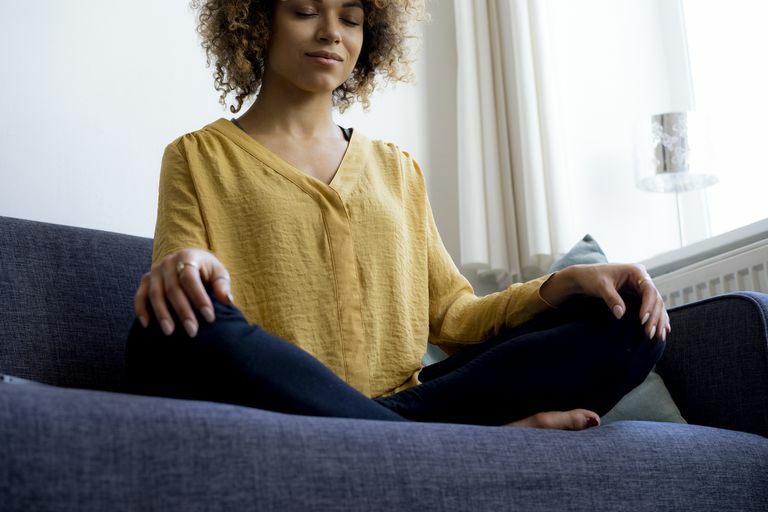 A meditation app can help ease stress. Modern life is stressful, and technology is one of many culprits that contribute to many people's high levels of anxiety on a daily basis. Yet turning to your smartphone could actually help alleviate stress, especially when you have the right relaxation app. These apps aim to help you relax and increase mindfulness by guiding you through a meditation practice. The apps listed here are available for both Android and iPhone. Some of these apps do have optional add-ons, such as additional guided meditations, available for download for a cost. Some of them also have premium versions that unlock additional features, but the free downloads include the features mentioned in the write-ups below. Additionally, many of them offer communities where you can interact with other users who are interested in subjects such as mindfulness, stress reduction and meditation. The ability to keep track of the time when you want to meditate for a specific period. You can select from a variety of ambient sounds (or just choose silence) and can opt to hear interval bells. Plus, there's something satisfying about being gently brought back to reality by the sound of a gong at the end of your designated meditation session. There are so many meditations that it can be difficult to find one. A tough problem to have, we know. , all of which are free like the app itself. That's probably why it's logged more than 1.8 million users and is one of the best-known meditation apps around. You can also use the Calm app for either guided or non-guided meditation that isn't part of any of these series or programs, but it's definitely worth exploring the various features when you download this app. Calm stands out from other similar apps with its focus on improving sleep quality; check out the seven-day program dedicated to just that. The cost to pony up for a subscription to access most of multi-day series options. This app is all about decreasing your stress and anxiety levels, increasing your overall happiness and improving the quality of your sleep. To accomplish these goals, the app guides you through multi-day series. These include 7 Days of Calm, which provides an introduction to mindfulness and meditation; 7 Days of Managing Stress, which introduces you to anxiety-reducing techniques; and 7 Days of Gratitude, which focuses on getting you to appreciate what you have in your life. The app works with any web browser. You can't take a look at anything prior to signing up. It's free, but it would be nice to at least explore it in some way before turning over your email. is similar to that of the other apps mentioned here, improve your mindfulness through guided practice, but it offers a unique focus on music. In addition to browsing and choosing from the app's own library of tracks and meditations with a variety of different focuses (including mindfulness, stress, relaxation, and sleep), you can use the mixer tool to choose the perfect vocal and the perfect background sounds to create a customized meditation experience. You can even save the ones you like for future use. The app will ask you to select how you're feeling from a list of options: okay, anxious, sad, great or stressed. Even if you select the same emotion multiple days, the meditation you get will be different each time. has one of the simplest concepts among the various options suggested here: Each day, you get a different three-minute meditation that's customized based on how you're feeling in the moment. Aura also includes a mood tracker so you can see how you're feeling over time, and it offers daily reminders for completing short breathing exercises. You'll also find some of the more standard meditation app features like unguided meditations with nature sounds. The "insights engine" that attempts to show you how meditation is improving your life and a heart rate monitor that can measure your heart rate both before and after meditating (though this only works if you have an Apple Watch). Some of the best features are locked. Fork over the cash for them or stay stressed out. is focused on mindfulness with a variety of guided meditations. However, the Sattva app also adds a bit of gamification to the meditation practice by using challenges and trophies to keep you motivated. The app has an easy-to-use interface (and web options) for keeping track of your progress over time, both in terms of how many sessions you complete and how your emotions change. Families can set up sub-accounts from one login as well. It offers meditations for sports-related stress. The modules are a tiny bit clunky. But that's our only nit-pick for this app. Smiling Mind offers programs for a variety of age groups, including 7-9, 10-12, 13-15, 16-18 and adults.